When you look up the word “versatile” in the dictionary, you will find a definition resembling: “able to do many different things.” However, when you look up the word “versatile” in the dictionary, a picture of Los Angeles Clippers power forward, Blake Griffin, should appear. 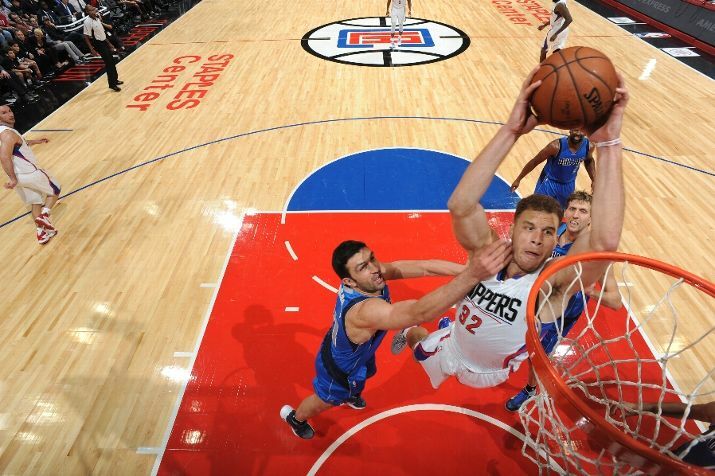 Who people once thought— not too long ago— was just a dunker, Griffin has become one of basketball’s best all-around players. With a playoff performance for the ages and an incredible start to the 2015-16 NBA season, Griffin has shown that it will take an army to stop him. Last post-season, Blake Griffin put up Oscar Robertson-esque numbers, while also carrying the Clippers far into the playoffs in the dominant Western Conference. He averaged 25.5 points per game, 12.7 rebound per game, and 6.1 assists per game which is incredible for someone Blake Griffin’s size. He also played an outstanding 39.8 minutes per game. Griffin put up two triple-double in which he posted 29 points, 12 rebounds, and 11 assists against the Spurs, and 26 points, 14 rebounds, and 13 assists against the Rockets. It is not just the stats that stand out when reviewing Blake Griffin’s phenomenal playoff performance, but also the way he carried his team through the back-breaking Western Conference stands out. 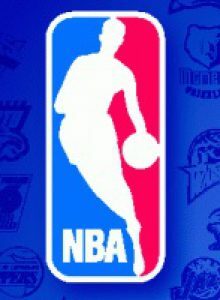 With help from Chris Paul, Griffin and the Clippers defeated the reigning World Champion Spurs in seven games. However, without Paul and with a subpar supporting cast, Griffin and company fell to the Houston Rockets. While Paul was on the sideline for the first two games of the series against the Rockets, Griffin played point forward, running the offense for the Clippers. If it wasn’t for James Harden‘s spectacular performance as well, Blake Griffin may have single-handedly led the Clippers to the conference finals. Enough about last season, let’s talk about what Blake Griffin has done thus far in the short 2015-16 NBA season. Griffin is averaging 32 points per game, 9 rebounds per game, and 4 assists per game in the first three games of the season while shooting .644 from the field. The 96 points he has scored is the second most in franchise history after three games, and is tied for second with Russell Westbrook (Stephen Curry is first with 118 points but he’s simply not human). 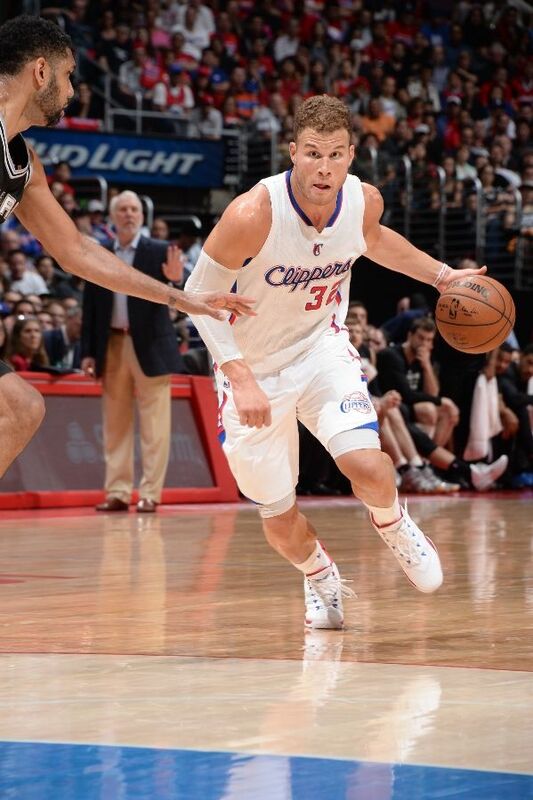 Blake Griffin has made significant strides in improving his jump shot. 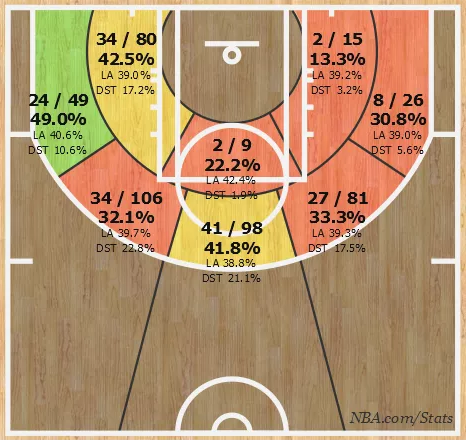 This season, Griffin has made 11 out of his 24 attempts from beyond 15 feet, which is 45.8%. 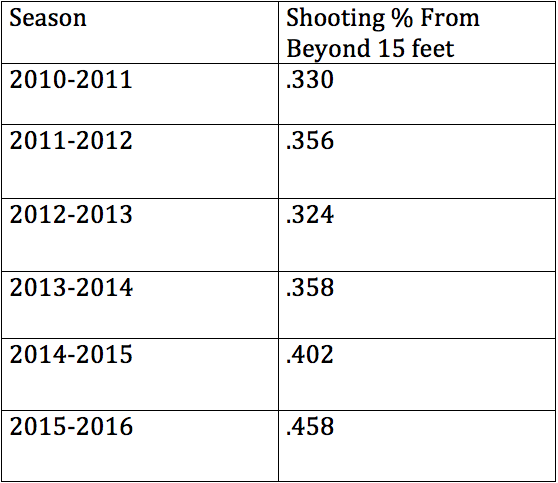 He has improved his shooting percentage from beyond 15 feet in almost every season he has been in the league (see chart below). 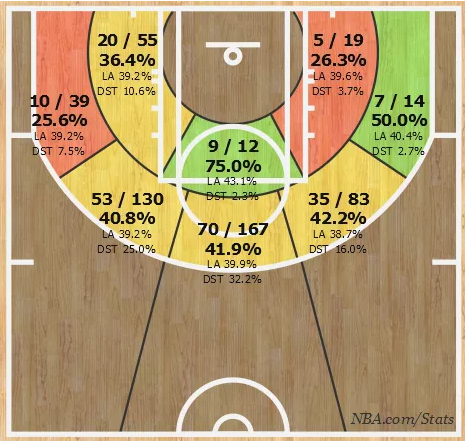 Griffin has improved his shot from almost everywhere on the court from last season to this season (see shot charts below). With a vastly improved jump shot and an explosive move to the rim, Blake Griffin is almost impossible to stop. This season, the Clippers are going to rely on Blake Griffin a ton. With an aging Chris Paul, Griffin is the focus of the Clippers offense, giving him the fifth highest usage percentage in the NBA so far this season. With his skill set and opportunity this season, Blake Griffin will definitely be an MVP candidate as the season goes on. Oh, and he is still one of the best dunkers and most exciting players in the NBA. I am actually glad to glance at this blog posts which includes tons of helpful information, thanks for providing these kinds of information.